German Chancellor Angela Merkel has defended Germany’s intelligence agency following allegations it helped the US spy on European companies. She says she will fully cooperate with a parliamentary investigation and provide “all the details” it needs. Chancellor Merkel was speaking for the first time publically about the accusations that Germany’s BND foreign intelligence agency helped the National Security Agency (NSA) eavesdrop on some of Europe’s top firms. She said it was imperative the BND continued to work with the NSA and the US to help in the fight against international terrorism. However, she also added that it was not acceptable for friendly nations to spy on each other. “This ability to carry out its duties in the face of international terrorism threats is done in cooperation with other intelligence agencies, and that includes first and foremost the NSA," Merkel told journalists in Berlin. 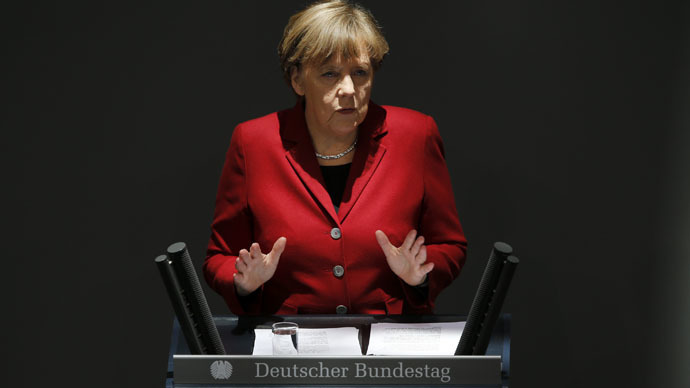 “Intelligence agencies are working to ensure the public's safety and the German government will do everything it can to ensure that it can carry out its job," the German chancellor added. Merkel said that her government would provide the German parliaments’ oversight committee “all the details” about the country’s cooperation with Washington. Two years ago, Merkel expressed outrage at the NSA after there were reports the agency had tapped her cell phone. The leader of the Green party Martina Renner also threatened legal action against the German government if it did not share detailed information concerning the extent of ties between the BND and NSA. “Merkel has to show now whether she wants to explain it or cover it up,” Konstantin von Notz, MP of the Green party told DPA. In April, the Bild newspaper said the German government had been “lying in black and white” in regards to claims they knew about the BND’s actions. The NSA had reportedly asked Germany’s intelligence agency, the BND, to obtain sensitive records, such as email and IP addresses as well as telephone numbers to help the American agency spy with certain European companies and the French government. European aviation consortium Airbus was one of the companies targeted, according to a report in Spiegel Online. The company responded on April 30 by saying it would file criminal charges over industrial espionage. "We are aware that as a large company in the sector, we are a target and subject of espionage," the company said in a statement to AFP. "However, in this case we are alarmed because there is concrete suspicion of industrial espionage." According to leaks by NSA whistleblower Edward Snowden, the BND has collaborated with the NSA for at least a decade.